Livepool progression to the Champions League group stages was sealed inside the opening 21 minutes thanks largely to haste and skill of Sadio Mané, who did not score in the period but assisted with two of Liverpool’s three goals. It always seems to be ifs with Liverpool but if they keep their front three fit this season, if they keep Philippe Coutinho from the tentacles of Barcelona and he ends up supplying the passes for Mané and if Liverpool simply let in fewer soft goals, their chances of winning silverware will increase dramatically. They are big ifs. Perhaps only a misery would be critical when Liverpool are so explosive going forward but Hoffenheim’s goals here were the type you’d now routinely expect Liverpool to concede: one where their two centre backs end up facing their own ‘keeper, another a free header inside the box from a cross. This had been a different type of test for Liverpool, one where the context behind the tie would not necessarily result in the mood inside Anfield bristling and being at its most belligerent, when there is a sense something needs to be overturned; those occasions when the power of the stadium is too much for even the most celebrated opponents. Liverpool held a lead going into this second leg having scored twice in Germany last week. 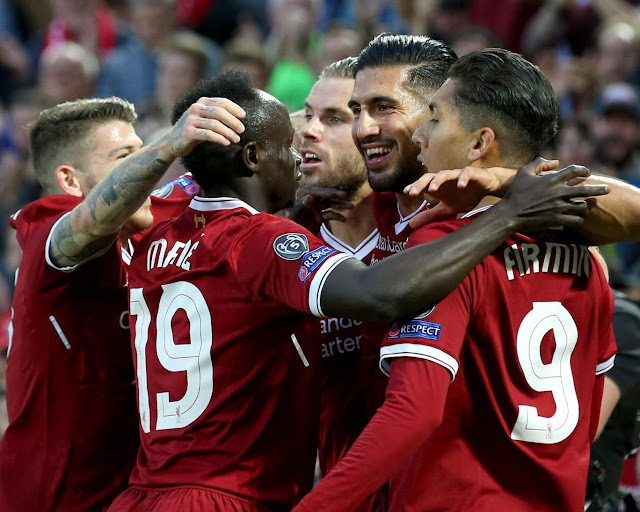 Considering Liverpool had never been eliminated from Europe after winning a first leg away from home on 33 occasions, considering too Liverpool had played German teams 18 times at Anfield and had never lost, they were expected to win here against a capable side in Hoffenheim – one, indeed, with only 90 minutes of European football behind them in their entire history. Hoffenheim had to score a minimum of two goals to have any chance of progressing and there were early signs that this factor would open space as a consequence. Hoffenheim’s coach Julius Nagelsmann is younger than James Milner and his approach was a bold one that on another night, could have contributed towards three goals for his team inside the opening half hour. Instead, because of Serge Gnabry's hurried finishing, Hoffenheim would only score once during that phase, critically conceding three. Emre Can registered Liverpool’s goal number one and number three and each build-up involved the speed and mind of Mané, who raced away from his markers twice before releasing a team-mate with a back heel. In between, Mohamed Salah poked in the rebound after Georginio Wijnaldum’s side footed effort had struck a post. In reality, the Champions League is not a competition that has glorious stories painted by the very youngest managers. In appearance alone, 30-year-old Nagelsmann could pass for a slightly mature university student. He surely must have known of the risks when choosing a high defensive line against a Klopp attack with such pace but at least he had the common sense to admit his decision was the wrong one and make a change. For that he was rewarded because within minutes of replacing Havard Nordveit and switching from a back three to a back four, substitute Mark Uth had fired past Simon Mignolet in front of the Kop to make it 3-1.